February 1969 marked the album’s second single, “Sympathy for the Devil” written mainly by Jagger after Marianne Faithfull gave him a copy of Mikhail Bulgakov’s novel The Master and Margarita. The story follows the devil as he visits Stalin-era Soviet Union. Originally intended to be played in a folk style, Richards suggested changing the tempo and adding percussion, turning the rhythm into a samba. The evolution of this incredible song was captured in the Jean-Luc Godard film Sympathy For The Devil aka ONE PLUS ONE. 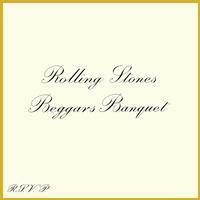 The original intended album cover art for Beggars Banquet was initially rejected both by London Records, their U.S. label as well as Decca, their UK label. The Michael Vosse photograph of a vandalized restroom wall (Jagger and Richards provided the graffiti, the restroom was inside a Porsche dealership) was deemed offensive, possibly because the top of an open toilet is captured in the shot. The replacement cover was simply the band name and album title written in the style of a wedding invitation, and remained that way for several years before the intended bathroom photo art was no longer perceived as offensive, and finally gained its rightful place on the cover.